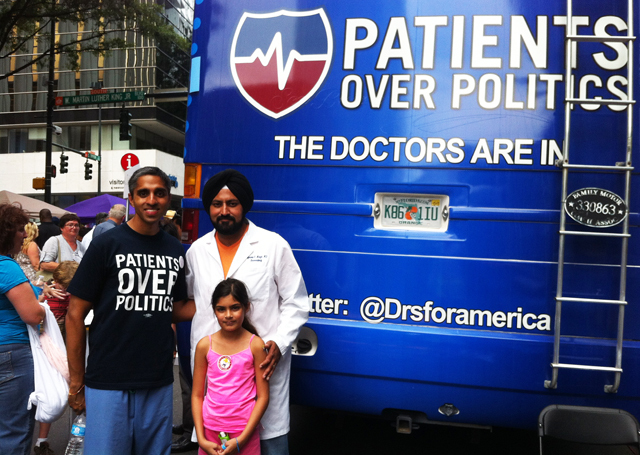 Party affiliation: Doctors for America is nonpartisan. Where are you coming from? We started in St. Pete/Tampa, Florida. How did you get to Charlotte? We have about 30 people traveling with us on the Doctors for America Bus Tour. Some of us are traveling on the bus, some of us are traveling in cars and minivans. We went to the RNC. We stopped in a few places in Tampa and Orlando. Then we went up to Gainesville (Florida). We stayed in a small town called Valdosta (Georgia). We educated people everywhere we went. We had events. Then we stopped in Atlanta, where we met with city councilmen at the State House and talked to them about healthcare. We also attended a health fair in Atlanta. We went on to Columbia, South Carolina, and then made our way up here, to Charlotte. How did you all come up with this idea? CoLab Radio is profiling people who have come to the Republican or Democratic National Convention with a purpose, but do not have access to any official party events. Post by Alexa Mills.